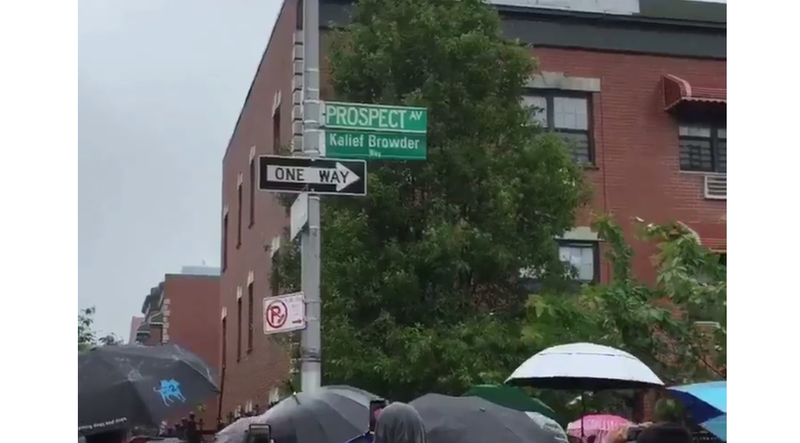 On Thursday, Kalief Browder Way was unveiled. An intersection in New York City’s Bronx borough was renamed in honor of a man who took his own life at 22 years of age after suffering a grueling, three-year imprisonment at the city’s Rikers Island jail complex because he couldn’t make bail. According to HuffPost, Kalief Browder Way—located at the intersection of Prospect Avenue and East 181st Street—was unveiled on what would have been Browder’s 24th birthday, and was just one of several remembrances to take place after the airing of the docuseries Time: The Kalief Browder Story, which detailed the repeated injustices that the young man faced after he was sent to Rikers at age 16 for allegedly stealing a backpack, although he was never convicted. Jay Z was the executive producer of the series. A week before the docuseries’ final episode aired in late March on Spike TV, New York City Mayor Bill de Blasio revealed a 10-year plan to close Rikers, a complex plagued by accusations of corruption and abuse. On April 10, New York Gov. Andrew Cuomo, with Browder’s family at his side, signed a bill that prohibited the state from charging 16- and 17-year-olds as adults. City Public Advocate Letitia James has also launched a campaign to rename the island after Browder when Rikers is finally shut down, HuffPost notes.